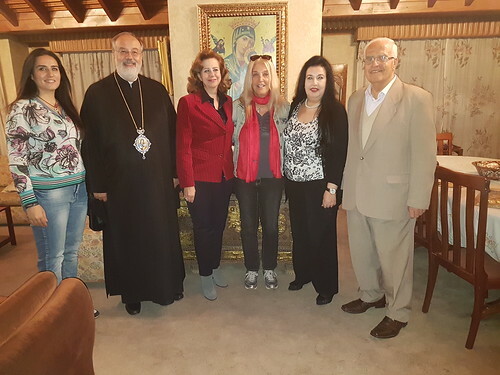 After the True Life in God pilgrimage to Russia, Metropolitan Georges Haddad, Greek Melkite Catholic Archbishop of the cities of Caesarea, Philip “Paneas” and Marjeyoun invited Vassula and Theodora to spend a week in southern Lebanon for a moment of prayer and meditation at his archdiocese in Marjeyoun. This diversion would allow them to rest a bit before Vassula resumed her evangelical tours. In solidarity, the Archbishop realized the enormous work Vassula and Theodora did in Russia. The accounts of this trip are as follows. When we arrived at the airport, Mgr. Haddad was there to welcome us warmly. We then headed south to the archbishopric. 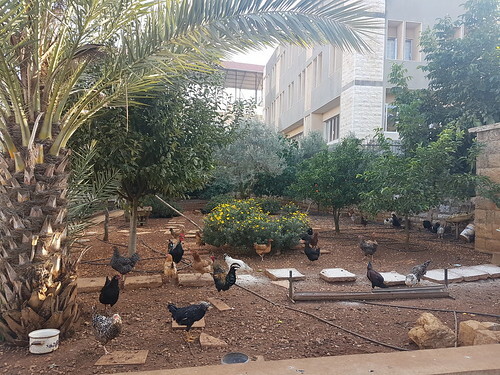 We began of our day with an exceptional breakfast: fresh eggs from the archbishop’s chickens. 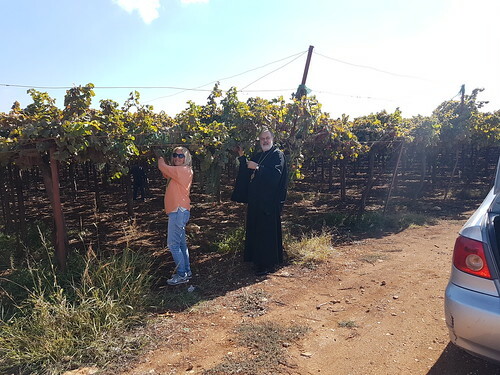 We then directed ourselves to the village of Kfeir for Mass. On the way, we saw Hermon’s mountain range. It is mentioned several times in the Old Testament as the Holy Mountain. Incidentally, Archbishop Georges Haddad told us that according to the first century historian Flavius Josef, the Transfiguration took place on this mountain.  I snapped two pictures of it and here is what we see. There were no explanations; did Jesus want to confirm His Transfiguration on the mountain!!! ??? Notice the mountain on the first picture is glazing white and the sky has taken a smooth golden tone. 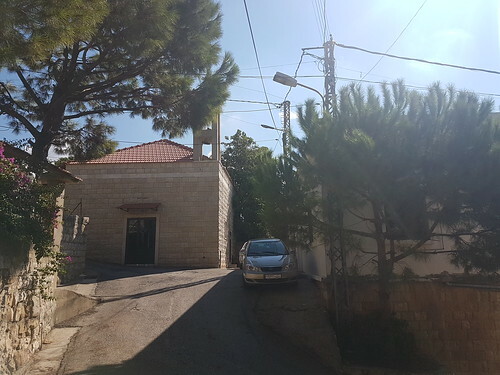 We arrived in Kfeir and visited the Church of Our Lady of the Assumption. The Virgin Mother accomplished many miracles in this village during the last war. 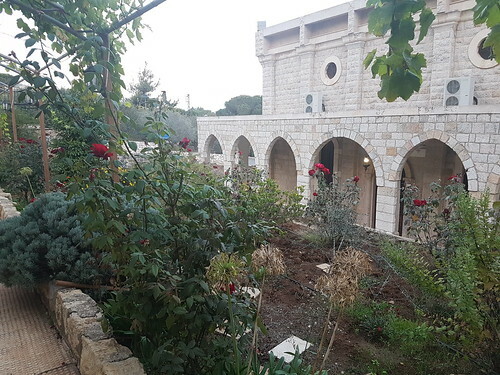 At the end of the Mass, a pious lady who continuously prays to the miraculous Virgin in this church, and who had never heard of True Life in God or of Vassula came to tell Archbishop Haddad that she had a dream. Two days ago Jesus showed her a dove on a dome, and a voice said to her "Jesus is walking in Marjeyoun." This was exactly where Vassula, the bearer of Christ’s message, was lodging. 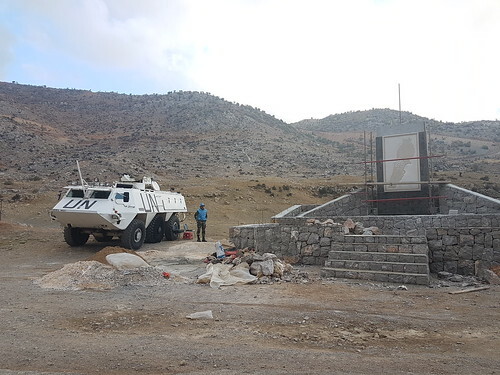 In the afternoon we continued our tour to the south, where, on the way, we saw the beautiful mountain range of Barouk. 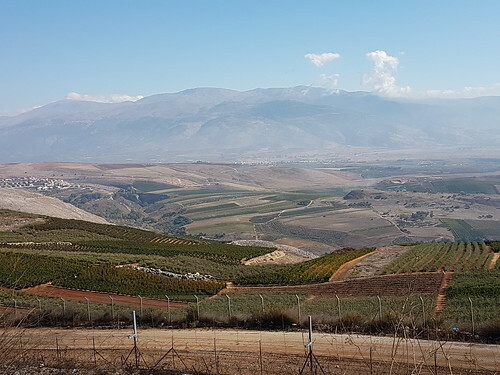 Finally, we arrived at Mount Hermon where we took the opportunity to walk within this holy mountain range. We were right up to the border with Israel. 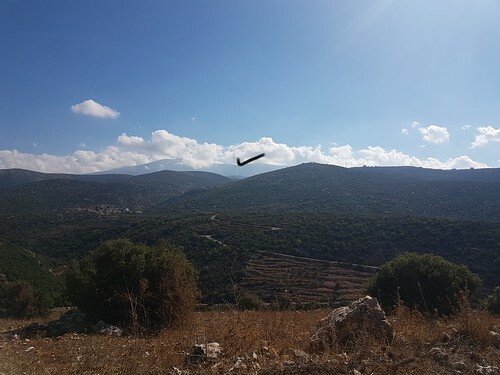 Well behind this mountain is the Joulan. On this same night, November 4, the bands of Nasrallah attacked the Lebanese army and were able to enter the Lebanese territory without the intervention of the Russians who were in Syria. This criminal band would have probably reached the village of Cheble. Sunday Mass, celebrated by Metropolitan Georges Haddad took place at 9:30 am in Marjeyoune. The Gospel reading was about the rich and poor Lazarus. After the homily, Bishop Haddad introduced Vassula and asked her to comment and link her experience with Christ’s call to the Gospel readings. Thus, Vassula talked about her latest book "Heaven is real but so is hell" by linking it with the Gospel of the day and the messages of TLIG. At the end of Mass, Mgr. 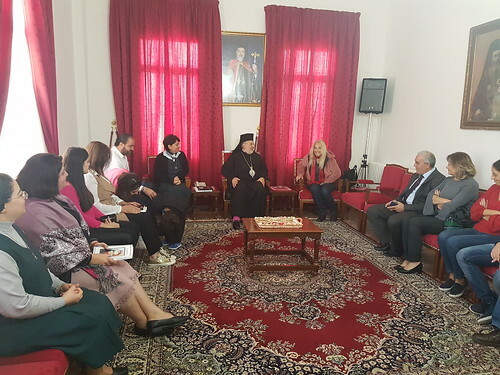 Haddad invited the faithful of Marjeyoune and Vassula to have coffee in the church lounge; the atmosphere was warm. The faithful had the opportunity to ask her some questions so as to deepen their understanding to the passages that she read. In the afternoon, Mgr. 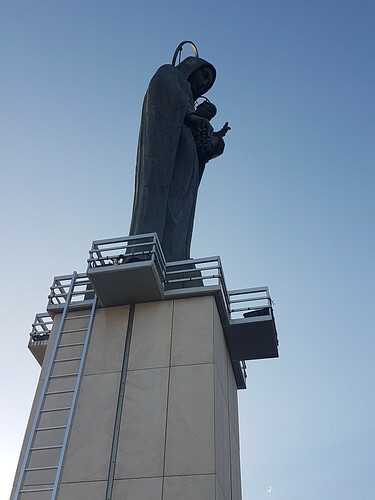 Haddad, along with some True Life in God friends, took us to Zahle, to visit Our Lady of Zahle who is well-known for the many miracles she performed there during the previous war. 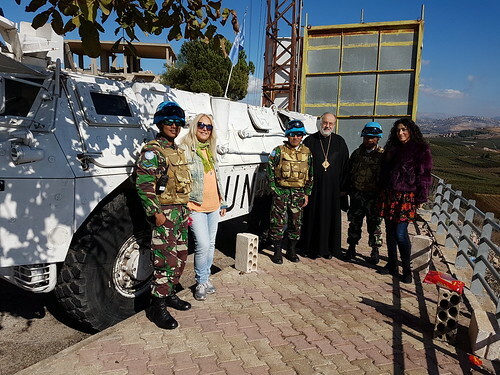 In Zahle we took the opportunity to visit Mgr. Haddad’s sisters who knew of the True Life in God messages; one of them had even come to our pilgrimage in Rome. They warmly welcomed us. We directed ourselves towards Biqaa West. This is a beautiful region thanks to the beauty of its nature. 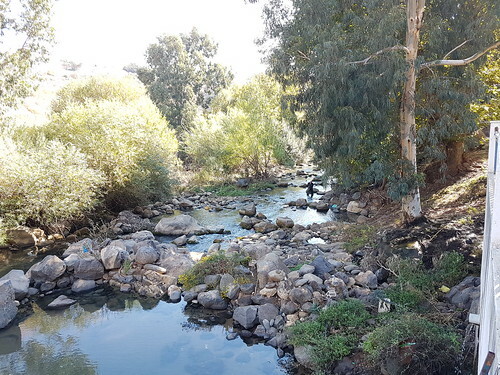 We stopped at the Wazzani River in Beqaa West, which reaches the Jordan River. On our way we saw farms: a rich agricultural landscape. Here is a beautiful moment where we took the opportunity to gather grapes. On our last day in the south, Mgr. Haddad took us to Tire to show us even more beauty of God’s creation. True Life in God friends were waiting to warmly greet Vassula and share a luncheon meal. 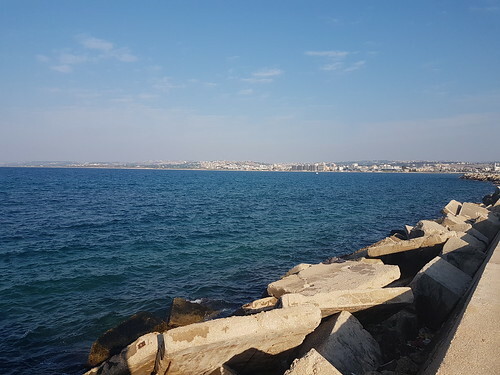 Photo Port of the city of Tire. 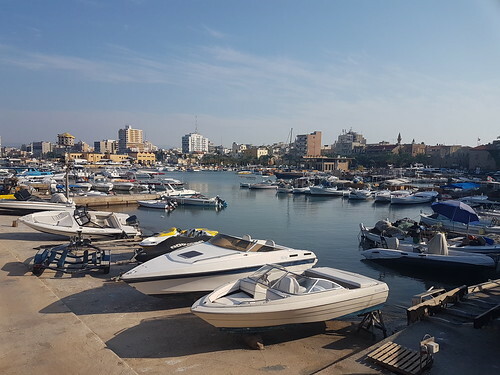 On this day we went back to Beirut. It was a quiet day. In the evening, Sheikh Mouhamad, along with Fr. 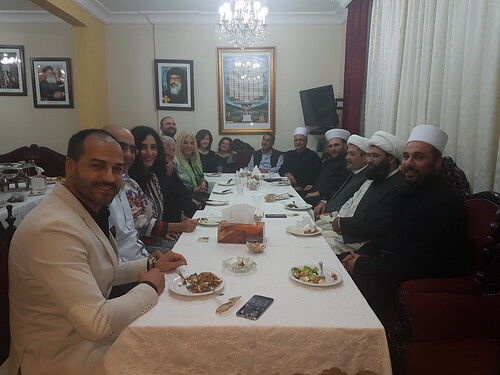 Rouays El Ourachalimi, President of the Coptic Orthodox Church in Lebanon, with the help of the “True Life in God" Lebanese group, invited Vassula, along with bishops and imams who were on the Russia pilgrimage, for a friendly dinner at the Orthodox Coptic Church. At the table, Fr. Emil Abu Mrad began our event with a song to the Virgin Mary followed by a blessing from Archbishop Simon Atallah. Sheikh Kazim told us that he felt great Love and peace from our pilgrims in Russia. While walking the streets, he felt this love and peace even from unknown Russians, who stopped the clergy to ask where they came from, then took their permission to take pictures with them. "That's how we have to live together all over the world forever, not just for a few days!” one of them exclaimed. 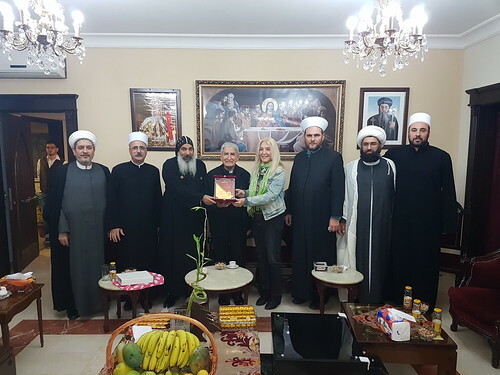 Before our departure, Father El Ourachalimi offered Vassula this beautiful icon of the Blessed Virgin and gave Sheikh Mohammed a medal for his successful work towards interreligious dialogue. At the end of the evening, the hosts proclaimed that they should invite Vassula back again next year to testify to TLIG and her experience with God. Of course, if it is in God's project and plan, this visit shall be realized. Before departing, we said goodbye with the feeling that we were leaving our best friends.